Whether you own one addon theme or one hundred addon themes, managing your themes and keeping things organised will ensure a fast and reliable workflow. This knowledgebase article will explain how to download and install new themes, delete unused themes, duplicate themes, work with saved style sets and how to get free theme updates. If you need help with installing new themes or other basic steps, please read the 10 minute quick start guide. Old themes you are not using any more (like demo versions or outdated versions) should ideally be deleted. Less addons will mean that RapidWeaver is faster and more stable. To delete themes in RapidWeaver, use your mouse and right-click on the theme icon, in the RapidWeaver theme drawer. From the popup menu, choose Delete. This is pictured below. Deleted themes will be moved to Trash, on your computer. From here they can be safely deleted from your computer by emptying the trash in the normal way. In RapidWeaver 6, installed addons (like themes) can also be deleted by opening the Addons window. Right-click on a theme icon and select Delete Addon from the popup menu. See the picture below. It's essential to ensure your RapidWeaver addons are kept backed-up at all times. Then should they get damaged or lost, you can easily retrieve them within a matter of seconds. Ensure that Apple Time Machine is active and operational on your computer. If you do not use Time Machine, then at least ensure other backups are regularly being made of your computer. Ideally there should be daily backups of your computer made. You are also permitted to make manual backups of themes to locations like Dropbox, GoogleDrive, iCloud or Amazon Cloud. The folder containing themes can be accessed on your computer by clicking the Manage themes and addons option in the RapidWeaver File menu. From here you can copy and paste themes to your desktop and create .zip compressed backups of your themes. If using RapidWeaver 6, click View > Manage Addons from the RapidWeaver menu. 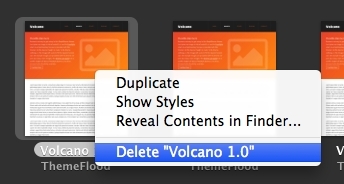 Right-click on any third-party addon and select Reveal Addon in Finder from the popup menu. That will then open a new Finder window, with all your installed addons. From here you can copy and paste themes to your desktop and create .zip compressed backups of your themes. If you're planning on making any modifications to any RapidWeaver theme, it's highly recommended that you always duplicate the theme. Duplication means making a copy of the theme to customise, leaving behind an original version in RapidWeaver, in an unedited 'master' state. Working from a duplicated theme is common practice, and ensures you can always return back to an original version of the theme at anytime. Also if you need to reach-out for technical support and help with theme modifications, these can only be applied to renamed themes. 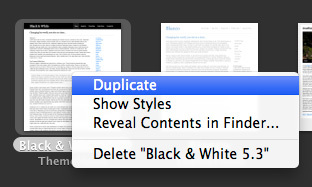 Themes can be easily duplicated within a few seconds by right-clicking (or control and clicking) the theme preview icon in RapidWeaver and selecting Duplicate from the popup menu, pictured below. Give the duplicated theme a new name (so you can easily identify the theme) and work from this newly duplicated version from now on. At this point you can click the new theme to apply it to your project. Any forthcoming modifications or customisations can be safely applied to this freshly duplicated theme. Duplicated themes will not be effected by future theme updates; meaning that updates or modifications you make will not be undone by future theme changes. We sometimes refer to these duplicated themes as 'child themes' or 'orphaned themes', because they are offspring from existing themes, but are no longer associated with any parent (original) themes. Duplicated themes are still covered by our customer support policy. Be careful with how you duplicate and rename themes. 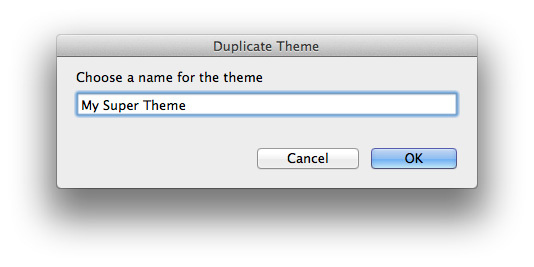 Simply renaming a theme in Finder does not constitute as duplicating or renaming a theme! 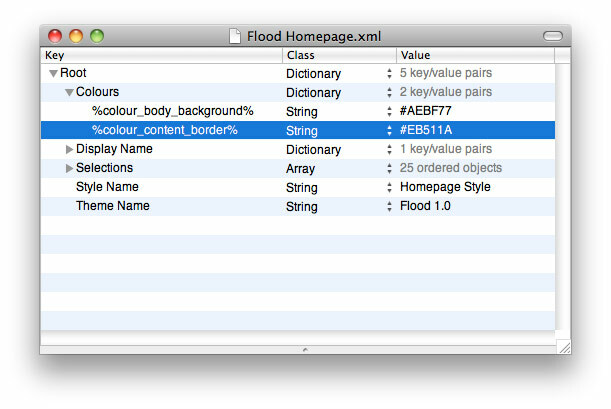 The reason being is that there are crucial pieces of code inside a theme which rely on 'bundle ID's' and 'short names'. The duplicating and renaming process described above will complete the job fully and update multiple instances of the theme name; whereas simply renaming a theme in Finder does not complete the task and is very likely to cause serious problems later on. After customising your theme using the built-in style and colour controls, you may wish to apply the same set of preferred styles to other projects. Saving theme style settings makes it easier to apply the same colour or style settings to other pages or projects. By far the easiest way to do this is to open the RapidWeaver page inspector and click onto the Styles tab. At the bottom, click the cog button and select Save Style As, pictured below. Now give this saved style set a new name or short description, so that you can easily select this in future. Click on the Save button when done. It's a similar procedure for all versions of RapidWeaver, although the exact buttons and interface may differ slightly. From now on, this saved theme style can be applied to other pages or projects. Please note that saved styles are not easily transferrable between other themes or theme versions (not impossible, but not very easy as you will read a bit later on). However you can share styles between other theme users and projects. Most users normally find it easier to use this above method to save styles, rather than relying on the somewhat cryptic 'Applies to this page only' or the 'Is the master style' radio button settings in the RapidWeaver 5 page inspector. RapidWeaver 6 introduced a new system of 'master' and 'individual' theme styles, which makes things much easier and may even remove the need to use saved style sets altogether. Basically you can go into the RapidWeaver Site Setup and create a Master style that will take effect over the bulk (majority) of your website pages. For any webpages that do not need to use the master style, you can deselect the master style in the RapidWeaver page inspector and apply custom styling instead. This is a useful little trick to know about if you are wanting to transfer saved style sets from a demo theme to the full theme, or likewise from an older theme to a newer version. Saved style sets are slightly more complicated to update, and in some instances the number of changes required may make it easier and more feasible to create new saved style sets again. Saved styles are located in the RapidWeaver addons folder and comprise of an XML file that instructs RapidWeaver as to which colours and styles need to be applied. You can access this folder using the Manage Addons option in the RapidWeaver menu. 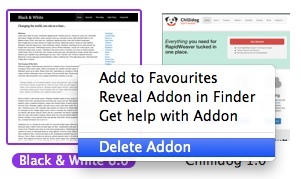 Right-click any addon and select Reveal Addon In Finder. Navigate up one level to the main RapidWeaver addons directory. Go into the Theme Styles folder. Copy the desired saved styles to your desktop. Change the file extension from .rwstyle to .xml. 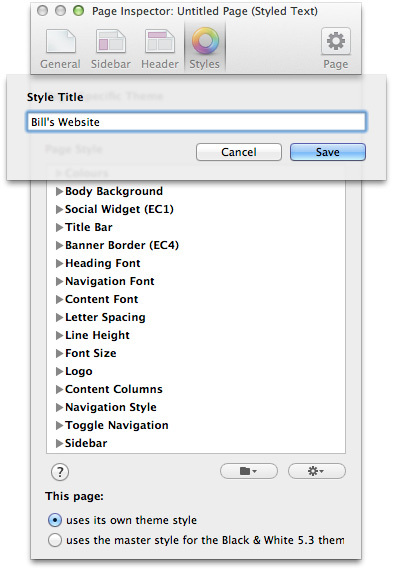 Then open the saved style in your preferred preference list editor, like PlistEdit Pro, pictured below. In this XML file, start by changing the theme name to match the name of your new theme. The style name can be changed as well if you want. Under the selections disclosure, you can change any of the saved defaults or add new selections which may be featured in the theme. The colours disclosure can also be opened and you can add new tags and default values. Colour tags are replaced with colours in the colourtags.css file, so you can study tags being used and incorporate any extra ones into your saved style. When you've completed editing, save the XML file and change its extension back to .rwstyle. This can then be installed in RapidWeaver by double-clicking the .rwstyle icon.